Made to celebrate your favorite little golfer-to-be, these quality, personalized pacifier golf balls come printed with a special message under an image of a pacifier with the phrase "Daddy's Little Caddy." 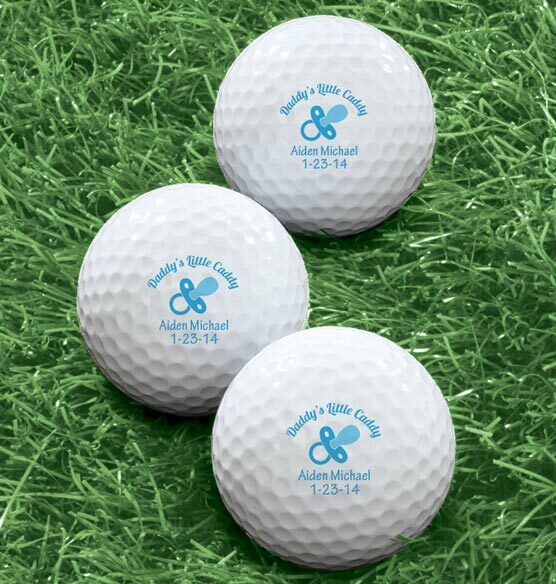 From the first tee to the back nine, these custom golf balls make a great gift for any golfing dad. One message per pack of six solid core white balls. Message comes in baby blue or pink. Specify message; limit 2 lines, up to 15 characters each. GREAT GIFT FOR MY HUSBAND !!!! I LOVE TO GIVE, BUT NEED MORE ROOM TO PERSONALIZED! MY HUSBAND LOVES THEM WHEN HE IS GOLFING! WERE DID YOU GET THEM, HE WILL SAY " GIFT FROM MY WIFE " PLUS HE NEVER LOSE'S THEM KNOW THAT THEY ARE PERSONALIZED!! !